Introduction: The study aims to assess if any difference in etiology, outcomes and treatment costs between the first 5-year and the second 5-year periods of the study. We hypothesize that length of hospital stay, hospital charges and mortality are decreased in the last 5 years of the study period to reflect advances in management of this condition. 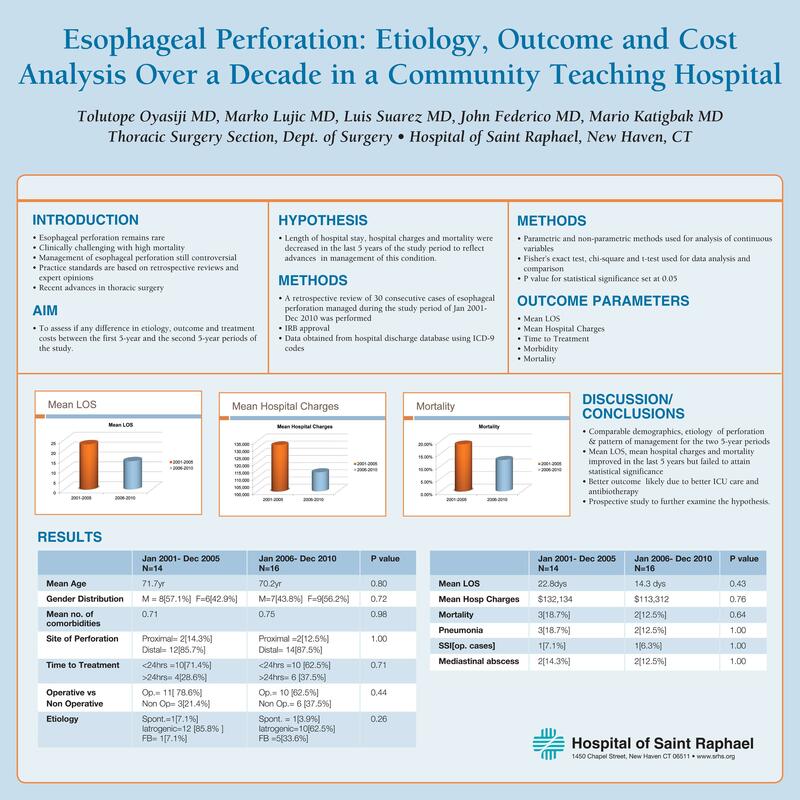 Perforation of the esophagus remains a rare but challenging clinical problem with significant mortality. Despite the many advances in thoracic surgery, the management of patients with esophageal perforation remains controversial. Practice standards are based primarily on retrospective reviews and expert opinions. Methods: An IRB approved retrospective review of 30 consecutive cases of esophageal perforation managed during the study period of Jan 2001- Dec 2010 was performed. Data analysis was done using parametric and non-parametric tests as appropriate. Conclusion: Both groups are comparable in terms of demographics, etiology of perforation & pattern of management. Outcomes like mean length of stay, mean hospital charges and mortality improved in the last 5 years but fail to achieve statistical significance. This argues for a prospective randomized clinical trial to further examine the hypothesis.